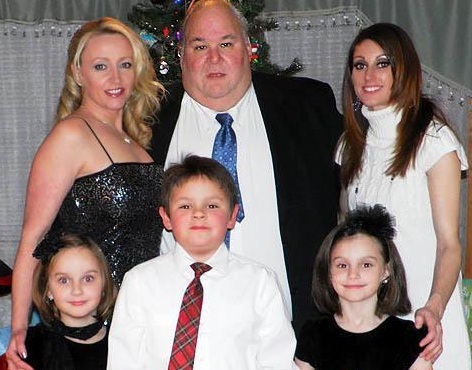 Daryl Benway of Oxford, Mass., with (clockwise from top left) wife Kelleen, youngest daughter Abigail, son Owen, granddaughter Arianna and daughter Nickole in December of 2011. WORCESTER, Mass. (AP) -- A man who had recently separated from his wife shot his two children, killing his 7-year-old daughter, before committing suicide, prosecutors said. A family member called police Saturday night after finding the bodies of 41-year-old Daryl Benway and his daughter, Abigail, in the master bedroom of their two-story Oxford home, Worcester County District Attorney Joseph Early Jr. said. Benway's 9-year-old son, Owen, was found shot in the head in the kitchen and was taken to UMass Memorial Children's Medical Center in serious condition. Owen has been in pediatric intensive care, a spokesman for Early said Sunday. He said he had no additional information about Owen Benway's condition, and a hospital spokeswoman would not comment. Benway's wife, Kelleen, returned home after the shootings, unaware of what had happened, and found a swarm of police cruisers and television crews, Early said. She was taken to the children's hospital, where authorities told her the fates of her children and husband. Neighbors told the Telegram & Gazette that Daryl Benway's brother Shawn lived on the first floor of the home with his wife and mother. Shawn Benway called 911 to report the shootings, Early said. Early said he couldn't speculate on a motive. He said the Benways separated weeks ago but were still married. No restraining orders had been filed against Daryl Benway, and he had no criminal record, the DA said. He had a gun license that expired in 1999, Early said. On Daryl Benway's Facebook page, his profile picture posted in December showed him with his family in front of a Christmas tree. He described the woman next to him as "my Beautiful wife Kelleen." Owen stood in front of him in a white dress shirt and red plaid tie, while brown-haired Abigail wore a black and white dress with a black hair bow. Daryl Benway listed his place of employment as TJX Cos., which operates discount retailers TJ Maxx, Marshalls and HomeGoods, as well as Ross Stores Inc.